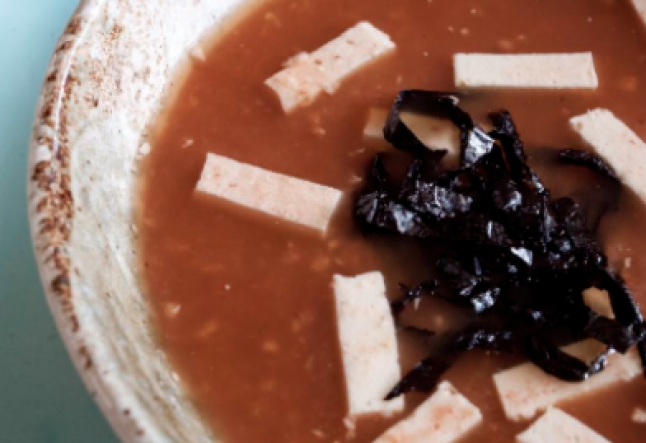 We use adzuki bean miso in this traditional fermented favorite, as well as our homemade Nofu. To make the Nofu, combine all of its ingredients and blend in high speed blender until smooth. Pour into a shallow pan, cover and refridgerate. Allow the Nofu to set up overnight for a more solid consistency. To make the soup, divide the miso between 2 soup bowls and stir into each 1/2 cup of hot water and a pinch of sea salt until dissolved. Add the remaining hot water equally to each bowl and stir again.